This first segment from last Wednesday’s Rachel Maddow Show is excellent for many reasons. One of the best aspects is the history lesson. There’s never a wrong time for resistance to connect with its history. If you already know how visually stunning the Bay Area is, skip to 2:30 and watch from there. 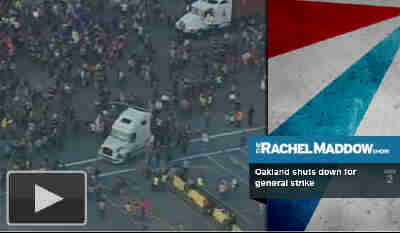 The information about general strikes (a whole different beast) and the 1946 Oakland general strike, starts around 3:15. Resistance always looks like this, from Women’s Rights to numerous labor battles and massacres (usually strikers vs. police and Pinkerton men). Elites always link arms; they always have to be forced to give in. Best to learn the history, know what to expect. Also, best to know how to win (the secret is always action). What can you do? Move your money on November 5.